Replacement Console Interface Cable for your CA12CD PTT industrial headset. 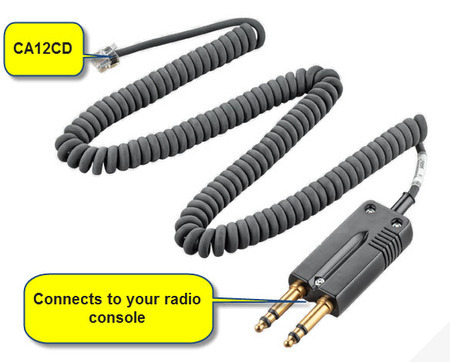 This cable has a modular plug on one end (to connect to your CA12CD PTT Wireless Dispatcher headset system base ) and a hard-wired PJ7 two pronged plug on the other (to fit your radio system console) . Plug the modular connector on this Console Interface Cable into the modular jack on the back of the your CA12CD Base Unit. Plug the other end into your Two-way Radio console. This cable is heavy duty industrial / mining quality. It is approximately 3 metres long.